Major Vernon Harcourt de Butts Powell MC shot himself on January 2 1918 after being injured in the World War 1. Major Powell was part of the Powell and Wale family from Little Shelford. Vernon Harcourt De Butts Powell, M.C. was born in Wellingborough, Northamptonshire in 1886 to Cecile H and Rev. Harcourt Powell. 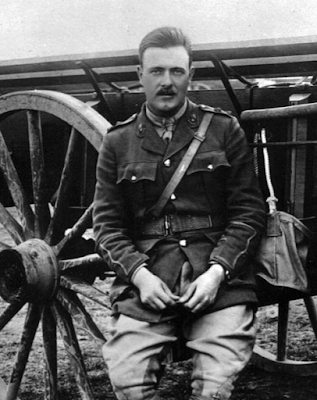 He was awarded the Military Cross for gallantry on the field in the Battle of the Somme. Powell originally enlisted with the cavalry but then obtained a commission as Lieutenant with the Canadian Field Artillery (CFA). He was promoted Captain at the front in 1916. At the Battle of the Somme, he was wounded and received the Military Cross for conspicuous gallantry. In September 1917 he was appointed Major of the 53rd Battery of the CFA. A month later he burnt his hands badly from extinguishing a fire among live shells in a gun pit. However he fought on. On December 7 he was severely wounded by an explosion and he was evacuated to england. He took his own life on Januaru 2 1918. Before Major de Butts Powell joined the Canadian Field Artillery on January 15, 1915 he served as a teaching master at Appleby College in Burlington, Ontario. The school was founded in 1911 and de Butts Powell was one of the original faculty, teaching English, and served from 1911 until 1914. His tenure had an obvious impact to the school’s formative years and a residence, “Powell’s House”, is named after him. The place and cause of death was registered as: “4th London General Hospital, Denmark Hill, S.E. 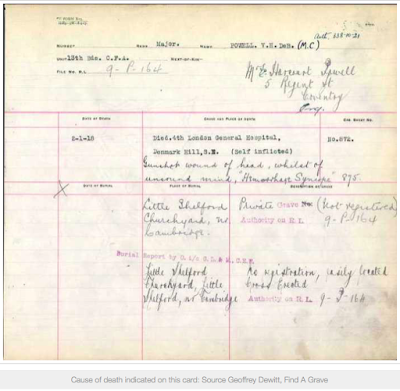 (Self Inflicted) Gunshot wound of head, whilst unsound mind…” The next of kin on the form is his mother Mrs. Cecil Henrietta Powell. He left her an estate worth $2,413 of which $2,000 consisted of life insurance and the rest in cash. This is a newspaper article from the time. Verdict of Suicide Returned in Case of Major Vernon H. Powell Who Died in London. London. Jan. 6. 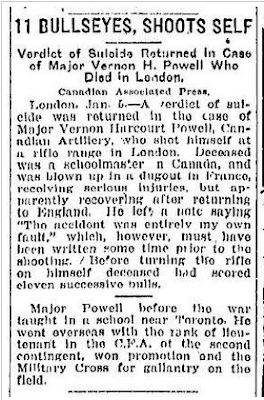 – A verdict of suicide was returned in the case of Major Vernon Harcourt Powell, Canadian Artillery, who shot himself at a rifle range in London. Deceased was a schoolmaster [from] Canada, and was blown up in a dugout in France, receiving serious injuries, but apparently recovering after returning to England. He left a note saying “the accident was entirely my own fault.” which, however, must have been written some time prior to the shooting. Before turning the rifle on himself deceased as scored eleven successive bulls. Major Powell before the war taught at a school near Toronto. He went overseas with the rank of Lieutenant in the C.F.A. of the second contingent, won promotion and the Military Cross for gallantry on the field.